How aggregating backup power for demand response and other grid services could unlock a big new C&I distributed energy market. The millions of backup generators installed at commercial and industrial sites across the country make up one of the largest sources of distributed energy. But most of it is fueled by diesel generators that are too dirty, noisy and inefficient to run during non-emergency times. Still, a small but growing number of natural-gas-fired gensets in the market are clean enough to run outside of the strict parameters set for diesel in many U.S. jurisdictions, albeit with some big exceptions like California. Last week, NRG Energy and Cummins unveiled a partnership that aims to take advantage of this flexibility to offer backup generators to a whole new class of commercial-industrial customers. The press release calls it a “platform,” and it is backed up by substantial in-market software expertise from both companies. The proposition is this: get a Cummins genset for use when the grid goes down, and shave 10 to 15 percent off your energy bills by allowing it to run as part of an aggregated fleet of a “preliminary estimated hundreds of megawatts capacity,” according to the companies’ press release. “Our value proposition to the customer is, we’ll enable you to provide services to the market without interfering with your operations -- and when the system’s not there, you still have power,” Rob Gaudette, president of NRG Business Solutions, said in an interview last week. Customers have been asking for backup power lately, he said. The largest factories, chemical plants, oil refineries and other critical assets already have significant on-site generation and backup capabilities. But the massive power outages in the wake of this autumn’s hurricanes in Texas, Florida and Puerto Rico have shown that backup power is also critical for gas stations, supermarkets, pharmacies, ATMs and other neighborhood sources of life’s necessities. The two companies have “successfully implemented distributed energy models for several customers over recent years,” the press release noted, although it didn’t name them. But Gaudette said the new proposition could be attractive to existing customers of NRG’s well-established demand response business, centered in the Northeast. These customers are looking for a new resource to replace diesel-fired backup generators, or provide the ability to match its summer demand response capabilities with a winter-capable resource to meet new seasonal market rules in mid-Atlantic grid operator PJM. 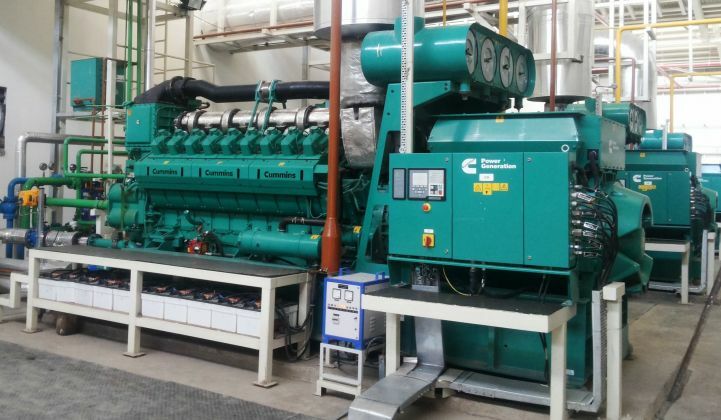 Cummins, one of the biggest generator manufacturers in the world, has been integrating its generators to software control platforms that can run them to shave peak demand, provide demand response capacity, or otherwise earn money during the hours when the grid’s still running. “You need the steel -- that’s the Cummins piece -- and you need the market interface,” Gaudette said. As with many of its distributed energy competitors, NRG typically owns the generator, and provides it to the customer as part of a power-purchase agreement or other contractual structure, he said. Customers in the program to date have seen 10 to 15 percent savings “across their entire energy spectrum,” he said. That includes the cost of paying for the generator, counterbalanced by spark spread benefits, demand response revenues, and more complicated values like how NRG manages each customer's exposure to fluctuations in energy prices. NRG, which owns a fleet of generation capacity that includes a good share of wind and solar power, has its own expertise in distributed energy deployments, most notably its contract with Southern California Edison to provide a combined 60 megawatts of capacity to help it manage the closure of the San Onofre nuclear power plant. NRG is working with startup Ice Energy to install up to 25 megawatts of its ice-making, load-shifting air conditioning systems; with Lockheed Martin Energy to achieve up to 30 megawatts of peak load reduction through commercial HVAC, industrial refrigeration, process cooling, compressors and lighting; and with its own demand response program aimed at achieving 5 megawatts of commercial and industrial load. NRG also developed its own software to analyze how distributed energy resources at the customer side of the meter will affect distribution grid circuits. The platform, dubbed SpaceTag, has mapped out DER potential for more than two dozen utilities as of earlier this year.